Pat Porter Centre president Doug Enns shakes hands with mayoral candidate Paul Neustaedter after a Wednesday announcement. On Friday, Neustaedter said he will fulfill his $13,000 commitment to the Pat Porter Centre by taking the funds out of his salary as mayor. Faced with criticism about a Wednesday announcement made in support of the Pat Porter Active Living Centre, mayoral candidate Paul Neustaedter chose Friday morning to unveil his plan for providing the centre with $13,000 in lieu of its annual tax bill. The money, Neustaedter said, will come right out of the mayor’s salary. On Wednesday, he told supporters at the Pat Porter Centre he would address their concerns but said details would be revealed only after the election. 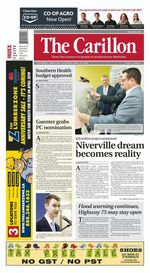 "I intended to reveal my plan after the election, as I had no intention to garner any votes because of how I’ve planned to do this," Neustaedter said on Friday morning. "That’s the plan that I have always had, to take this to council and have an approved reduction in my salary, and give an approved grant in lieu of my salary for approximately $13,000 to the Pat Porter Active Living Centre." It will happen, he said, even if council doesn’t support it. "If not approved by council, I would take it out of my salary myself and pass that money along to them. However, I prefer to do this with council." The mayoral hopeful said his commitment was to the Pat Porter Centre alone, when asked if it could extend to other organizations like the Steinbach Legion, which previously received a similar grant. "There’s many great organizations and the seniors are a very all encompassing group. That’s the one that I’ve chosen to identify at this time," he said. The city’s mayor is paid $44,000 annually. The mayoral candidate made the comments while making an announcement on Mooney Avenue, in the Clearspring Greens neighbourhood west of Old Tom Road. Neustaedter pledged to address the need for a walkway between the neighbourhood and the rest of the community. "I know that if a child was injured due to this unsafe situation of no walking path, any council would work hard on a plan immediately. We need to be planning this before any horrible accident taking place," he said. "I will make this a priority and encourage council that we will be working on targeting a one year completion time period for this pathway."